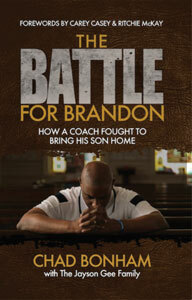 Longwood men’s basketball head coach Jayson Gee is the subject of an inspirational documentary and accompanying book, titled The Battle for Brandon: How a Coach Fought to Bring His Son Home, that premiered in May. The film and book profile Gee, entering his fourth year as Longwood’s head coach, and his family’s quest to help their oldest son, Brandon, overcome significant mental illness. Brandon was diagnosed with paranoid schizophrenia when he was 11 years old, sparking years of struggle for the Gee family that ultimately landed Brandon in a full-time treatment facility. Doctors gave Brandon a minimal chance to overcome the disease, but, over the next several years, Jayson Gee and his family embarked on a challenging journey to help their son. After years of treatment, Brandon overcame the disease and is now enrolled in college. The documentary and book, written and produced by Chad Bonham and White Wolf Creative, will be unveiled in a series of premieres in Florida, Virginia and Gee’s home state of West Virginia.